Random Audio Sample: Lily's garden : flute solo by Brian Brown, from the CD Short cuts: 13. Brian Brown was a leading voice in Australian modern jazz from the late 1950s, which is when he formed the first Brian Brown Quintet. In the 50 years of his career, he led 12 ensembles, each with its own distinctive sound. Brian's instruments were alto and concert flutes, panpipes, soprano and tenor saxophones, the Yamaha WX5 Wind Instrument and synthesizers. His unique sound included three leather bowhorns, made for him by the late Australian leather sculptor, Garry Greenwood. He performed internationally on nine tours, the first in 1978 when the Brian Brown Quartet became the first Australian ensemble invited to play at the Scandinavian Jazz Festivals, alongside Ornette Coleman, Max Roach and Freddie Hubberd. In 1980, Brian Brown established the Improvisation Studies course at the Victorian College of the Arts in 1980, unique in Australia with its focus on students developing an individual voice. From 1980 to 1998 involved some 600 students in small group performance during the weekly workshop classes. Brian also mentored and/or individually taught students who are now leading performers both in Australia and internationally, including several winners of the Wangaratta Festival of Jazz National Jazz Awards. Brian's compositional output consisted of 215 notated and catalogued scores, ranging from solo instrumental works and pieces for choir to music for small groups and large ensembles including full string and brass sections and multiple percussion. 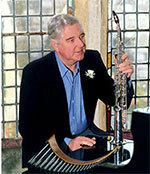 Between 1957 and 1998 Brian recorded 12 LPs and CDs plus a video of his opera Winged Messenger, commissioned by the Montsalvat (Eltham) Arts Trust. After his retirement from the VCA in 1998 he produced 67 CDs, including 27 solo improvisations, 12 duos with Scott Dunbabin (bass) or Ros McMillan (keyboards) and 11 with his last ensemble, the Brian Brown Trio. Another 17 CDs were concert performances (1960 - 1990), including Moomba 77, featuring Dizzy Gillespie with an expanded Brian Brown Quintet plus Don Burrows (flute), Keith Hounslow (flugelhorn) and brass, string and percussion sections. Kit: Moving On : the life and music of Brian Brown / music resource kit by Lorraine Milne.